2.Move the antenna,find a good signal receiving place without any obstacle and re-scan for channels. 3.You would better to keep the antenna away from the sources of interference, keep the antenna away from those big power consumption devices, such as air conditioner, elevator, hair dryer and microwave oven etc. 4.Don't rush to attach the antenna to the window glass or wall before finding the best signal location, because the 3M tape will lose its stickiness after repeated use. Wide Range of Search：Magnetic ring to lock signal and amplifier signal booster,Antenna TV Digital HD reaches up to 90 miles and picks up clear & crisp sharp local TV channels. Support Format: 720p, 1080pi, 1080p/ATSC. This 90 mile range hd antenna enables we to watch local broadcast channels with high definition for FREE. Get this digital antenna and save monthly cable fee forever. 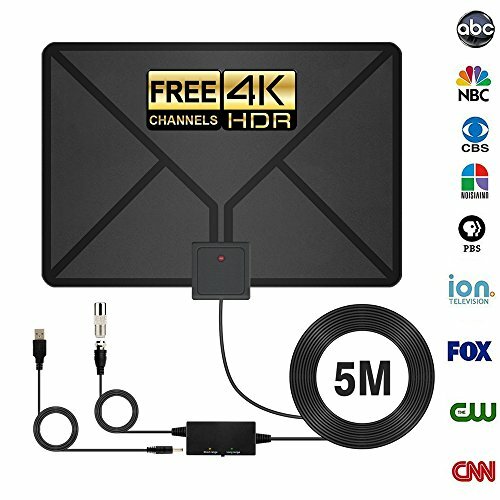 Free Channels:HDTV Antenna With hundreds of free channels, you get rid of the high fees for watching digital TV.Our HD antenna Best on the Market and can receive free FULL HD Channels like ABC, CBS, NBC, PBC, Fox and so much more. Tv antenna start to access all of the news, sitcoms, kids and sports programs! High Strength Material And Design: The new environmentally friendly flame retardant PC soft material and high-performance ultra-thin design bring moisture and lightning protection to our indoor HDTV antennas. You can use these digital TV antennas to watch your favorite TV shows without worrying about thunderstorms.updated version has the anti-static and anti-lightning function. Long Enough Cable : Indoor antenna 13.12ft Antenna Cable with 3.28ft Signal Booster,Makes clearview hdtv amplified antenna 1080 hd easier for you to place it in your house to get the best reception, especially for customers whose televisions are quite far away from windows. Smart IC USB Power Adapter with built-in overvoltage protection has less signal attenuation, to ensure clear and stable picture quality. If you have any questions about this product by GESPERT, contact us by completing and submitting the form below. If you are looking for a specif part number, please include it with your message.